I was born in a Hindu family, but when I grew up I became an atheist. I simply did not believe in God and religion. I preferred to be a free thinker. I had a decent job with responsibility, and at the same time had drinking habits, was a chain smoker and a gambler as well. It is unfortunate that I had the company of some bad dignitaries. During this time, I was married with five children, and was in a way an irresponsible husband to my wife and children. One could say I was a very bad example to my lovely children and my family too. I never realized this until the day I accepted the wonderful Baha’i Faith much later. It was in the year 1966 when Mr. Sammandari, an Iranian Baha’i visited Tanjong Malim -the town where I lived and worked. It was later that I came to know that he was a Hand of the Cause of God. It was on one fine afternoon that some of my close friends were uttering the word “Bahai” around the town. I did not pay much attention to them and had no interest at all. I believed someone must have brought Mr. Sammandari to this town, and he must have addressed some group of people. I had no further knowledge. That was the first and last time I heard about the word Bahai, though not knowing the essence of it. Ten years passed. In the year 1976, my family came in contact with late Mr. Jamie Maniam of Kajang, his brother in-law Mr. Ramu who was an Assistant Manager in a plantation in Sungkai, and the late Mr. Ramanaidu who was a teacher in Bidor at that time. We did not know much about them, as they were not part of my circle of friends. During this time Bornoh Das was working with Ramu in Sungkai. One fine morning I went to work as usual, and Bornoh Das knocked on the door of my house, and wanted to see us. Parvathy, my wife said I was not at home, and so Bornoh Das requested permission to talk to my wife. My wife allowed him into the house, and Bornoh Das spoke on the Baha’i Faith. He gave some pamphlets to my wife, and within that first introduction of the Faith, my wife had accepted the Faith there and then, without any hesitation. That was in 1976. I did not stop her, as I knew fully well that my wife would only do the right thing. I gave her all the freedom to choose her own belief. Later Mr. Ramanaidu, Mr. Ramu and Jamie Maniam followed up by visiting my home regularly. They deepened my wife on the various aspects of the Faith. Now the test started for my wife. I did not like these guys coming to my home very often, as I felt they were a hindrance to me and my privacy. Almost daily my wife and I used to have quarrels and enter into heated arguments. There were days when did not talk to her for days. The worst part was when she started to preach on the existence of God to this atheist husband of hers. I used to refute in my strongest ways. Things would become worst, especially when I came home drunk. I even went to the extent of humiliating her by breaking the beautiful statue of Lord Muruga, a Hindu God. I broke it into several pieces with my right leg and shouted to my wife, “If you think there is a God, now tell your God to paralyze my leg, the very leg with which I broke this statue.” It was a terrible shock to my mother in-law and children who were watching all these. It continued in this fashion daily for almost one year. It was all nothing but argument on the existence of God, and we always ended up in disagreements and disputes. I use to torture my wife with question after question, for which she sometimes could not provide a satisfactory answer. However, the love we had for each other was intact and unshaken. We were clear on that. Here I must mention something about my dear wife – Parvathy Govindan Nair. She was well educated in the Tamil language in a primary school, after which she studied up to Form three in an English secondary school. She also picked up good knowledge on Hinduism, and was bookworm too. Her greatness was her total patience with me. She was a very tolerable person as well. She had by then developed a strong Faith in Baha’u’llah. Whenever she was in the company of our children, she said a lot of Baha’i prayers. Her prayers were answered, as I realized that I was soon becoming much calmer, and well composed as time went by. I could see the changes that were happening around me. That triggered me. Once in awhile, when no one was watching me, I used to read the Baha’i pamphlets and glance through the prayer books kept in the house. At times I had even quietly read the prayers. I admit the prayers had some effect on me. Although my wife was the one of the earliest Bahá’ís in Tanjong Malim, she could not teach the Cause, all because she was not mobile, and had to depend on me for moving around. At that time, I had only a motor-cycle. Because of this, I started to welcome the company of Bahá’í visitors to my home. I myself helped to arrange many firesides for my wife in my house and nearby places. But I would not participate in any of the firesides. I would quietly slip out to join my drinking colleagues, and come home late nights, after the Baha’i visitors had returned. However, I slowly became very close with Ramu and Ramanaidu. They were smart. They now they turned their attention towards me. On many occasions they advised me on the ill consequences of my drinking and smoking habits. As they became closer to me they sometimes even went to the extent of locking me up in my own house, so that I would not be able to go to meet my drinking colleagues. As time passed, I slowly began to realize changes within me. Exactly after one year, I decided to accept the Faith, in 1977. It was a midnight when I signed the declaration card. My wife was the happiest person. But here was the catch. As soon as I accepted the Faith, it became a great challenge for me to give up my bad habits. I had a strong battle raging within me. I was worried that I might not win the battle. Slowly the remedy for my bad habits was coming my way. By accompanying the Baha’í friends, things became better for me. With spending more time with these these God fearing Baha’is, I could not spare enough time with my drinking colleagues. The time I spent with those colleagues was drastically reduced, and finally cut altogether. I ultimately made a firm decision not to drink. And that was final. With this turn of events, and with the Baha’is always seeking me, I was more involved teaching the Faith. Ramanaidu was my Baha’i mentor at that time. My wife and I started to follow Ramanaidu wherever he went in our surrounding areas. Accompanying him for teaching trips gave me a new kind of unknown strength within me. Soon my wife and I were able to stand on our own, and we ourselves started to hold firesides on our own. This was the time when we started to purchase several Baha’i books. The books that really inspired us at that time were – The New Garden, Release the Sun, The Hidden words of Baha’u’llah, The Seven Valleys and the Four Valleys, The Glad Tidings of Bahaullah, and The Bahai Faith- an Introduction. The simple books on the Bab and Baha’u’llah and small compilations from the World Center were also adding to our spiritual nutrition. My own transformation soon became the talk of the town. When I was able to suddenly stop my drinking habit my father in law Mr. Govindan Nair was totally shocked and he asked my wife what could have transformed me all of a sudden. My wife answered her father, “He is now a believer in Baha’u’llah, and the teachings forbid him from drinking. He has to set an example if he has to teach the Faith.” That had an immediate effect on my father in law. On seeing the transformation within me and the explanation given by my wife, my father in-law immediately became a Bahai. This time my entire family set out on aggressive teaching activities. The teaching work went on like wild fire in the area. My so called dignitary friends came to know of my movements. Ten of them called me to a restaurant in the town for a meeting. That was also a drinking session. Everyone except me was drinking. Instead of beer and I asked for Chinese tea. This immediately angered them. They shot question after question as to why I was not drinking anymore. I politely told them that I had embraced the Baha’i Faith and that it was against the principles, and went on to mention the ill effects of consuming alcohol. An argument sparked off in the restaurant and they all cursed that I was a disgrace to the Hindu community by becoming a Bahá’í’. They said some Hindu people had also topped carrying Kavadi. As time went by they openly humiliated and abused me for accepting the Faith. In public they once poured glasses of beer on my head. They were at one time my best friends. My anger shot up at that time, but it was my strong faith that calmed me down. I kept on praying. But the situation was to change in no time. One day they told me “We are happy that at least you gave up drinking, and we are happy for you. But it is we who are not able to give up.” On that day I was with them until they all were fully drunk. I quietly came home. As days pass by more of those very friends accepted the Faith and we were able to form the first Local Spiritual Assembly in Tanjong Malim. I was boasting around that I had given up my drinking habit altogether, but my struggle to quit smoking was still on. I tried many a times but still failed. On this matter once my wife even attempted suicide, and landed in hospital all because I could not give up my smoking habit. She was worried that I would not be able to set an example in the teaching field with cigarette in my hand. The Tanjung Malim community grew and there were about 15 children. There was no one to teach the children. I volunteered and started the children classes. There were weekly children classes based on the Bahá’í virtues. The children were taught lessons on virtues, spelling, and memorizing verses. During the classes I was explaining about the bad habits, and one of them was smoking. During the classes the parents were watching the way I conducted the classes. At that time my younger son asked me, “Daddy, you said smoking is a bad habit. Then why are you always smoking in the house and everywhere?” That sudden question came like a rude slap on my face. I could never ever forget that incident in my life time. From that day onwards I completely stopped the habit. Even my wife’s suicidal attempt had failed in making me quit smoking. As a children class teacher I had to be an example for the children, and as a father I had to be an example to my children. One more test was still in store for me. The greatest test for my family was the breaking of idols in the Hindu temples that was going on throughout the country in 1978. At that time the statues in the Hindu temples were broken in the middle of nights, or at times in the early dawn. This happened in Tanjong Malim and the anti-Baha’is seized this opportunity to make a scapegoat of the Baha’is. They made a police report saying that it was the work of the Baha’is, and they particularly named me and my wife as the culprits. This was the time when he had just opened the Kerling Estate and its surrounding area, and the Behrang River for the Faith. Another Assembly was just formed in Behrang Maju Ternak. It was a serious and explosive issue at time in Tanjong Malim. At that time some Indian youths were guarding the temple in Kerling town. One day after midnight few irresponsible guys went into the temple and started breaking the idols. The watchful Indian youths attacked them and one of them was murdered, while the rest escaped with bad injuries. It was a big case. After this incident, it became clear that it was not the Baha’is who were breaking the temple idols, and the names of the Baha’is were cleared off the record. As a Medical Assistant in the estate, I used this God-given social status to open many surrounding estates for the Faith. Tanjong Malim saw focused growth at that time. Many could be attributed to the growth. Ramanaidu and Ramu regularly visited and deepen us. Among others were Dr. M.M. Sreenivasan and his wife Molly, the late Dr. Maheswaran, the late Mr. Satanam, Mr. Ganesamurthy, Mr. Inbum Chinniah, Mr. Murthy, Mr. Param, Mr. Y. Mari, Mr. T. Maniam, Mr. Bornoh Das. In the cinema hall of the Escot Estate, Dr. Sreenivasan screened the GREEN LIGHT EXPEDITION documentary on the travels of Amatu’l Baha in the Amazon jungles in South America. Half way through the show new came that an old lady had died in the estate, and the show has to be stopped out of respect for the departed lady. Then we shifted and continued screening that show in the open space in front of my house. We pitched a large screen and sat in the open air to watch the continuation of the documentary. My wife, in her usual warm hospitality made hot tea and provided snacks, very apt for the occasson. Even an air-conditioned cinema hall would not have given that atmosphere. It was simply very joyous. As many came into the Faith in the surrounding estates, special deepening classes were held for them and Baha’is from outstation would come over to conduct them. I remember once Manisegaran came with Dr. Nathesan and Shanmugam to conduct a course on Hinduism. Many of such events were common in those days. We were happy to see our house serving as a stopover for the Baha’is travelling on the north south trunk road. Before the North South Highway was built this was the only road. Many would stopover and rest and continue their journey the following day. That night would be a good deepening for our family. Some would stop over for a bath on a hot day and proceed while others would come for tea. There was a time in the late 1970s that Dr. Sreenivasan was tapping on the talents of some believers to produce audiovisual materials in Tamil. My wife and Manisegaran were well utilized for this purpose. I used to take my wife to the home of Dr. Sreenivasan where the recordings were made. In later period, my wife and I realized that to serve the Faith well needed a car. 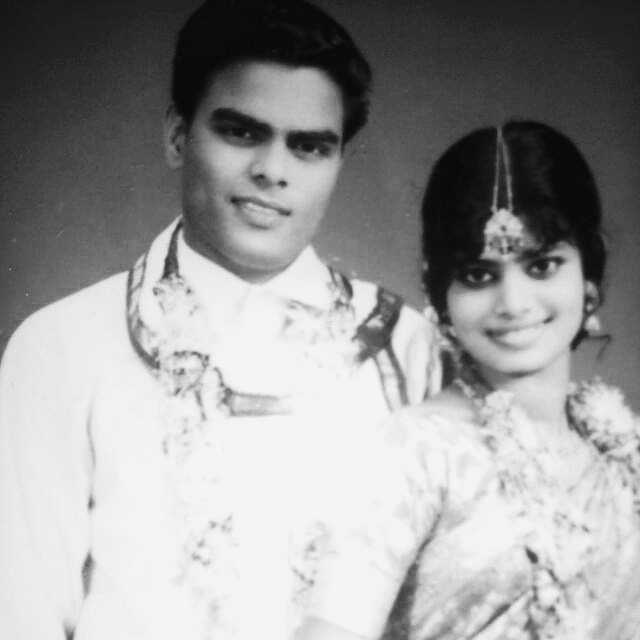 We both started an agricultural project in front of our bungalow on a disbanded graveyard of six acres. We planted cash crops such as ground nuts, tapioca and finally water-melon on crop rotation method. From the earnings we managed to buy a second car, and our whole family was able to serve better covering vast areas in the region. My wife and I teamed up well and became part and parcel of serving the Faith as one single unit. When I reflect, I wonder how I could have changed into a new person altogether. I am clear that the power of transformation was in the hands of Baha’u’llah alone, and it was through His Infinite Mercy that I was completely transformed!